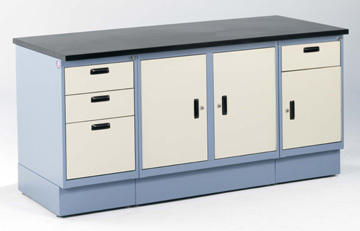 Heavy Duty Modular Cabinets (casework) - 16 gauge steel. 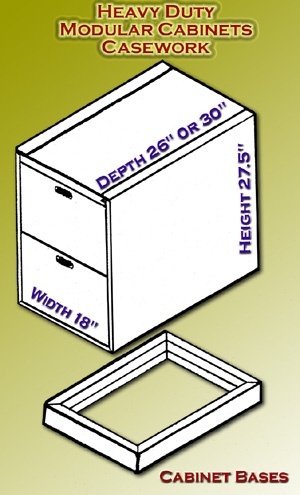 Drawers offer 95% extension slides with 100 pounds capacity per drawer. Recessed handles & Polished aluminum drawer/door hardware available, recessed handle shown. Powder Coat Paint. Shown Two Tone Textured Blue & Textured Beige. Other colors available. Pedestal drawers available with optional gang lock - a single lock secures the entire casework module. Double or Single Swing Door Sink Base. Stainless Steel sinks. 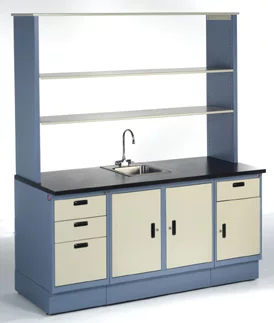 Swing door cabinets include one adjustable shelf. Adjustable glides for level installation. 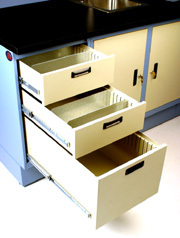 Chem-Guard - "chemical resistant laminate"
Drawers feature 95% extension slides with 100 pounds capacity per drawer. Inside of drawers are slotted to accept optional dividers every 1" for optimal organization. 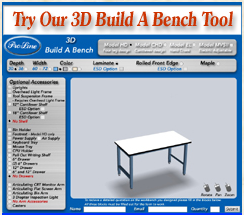 Cabinet bases include leveling feet. Wgt 26" 118 lbs. 87 lbs. 87 lbs. 76 lbs. 76 lbs. Wgt 30" 132 lbs. 99 lbs. 99 lbs. 87 lbs. 87 lbs. Wgt 26" 111 lbs. 122.5 lbs. 127 lbs. 104 lbs. 136 lbs. Wgt 30" 125 lbs. 136 lbs. 141 lbs. 118 lbs. 152 lbs. Wgt 26" 95.5 lbs. 95.5 lbs. 91.5 lbs. 91.5 lbs. Wgt 30" 107 lbs. 107 lbs. 102 lbs. 102 lbs. Wgt 26" 104.5 lbs. 104.5 lbs. 120 lbs. 73 lbs. 73 lbs. Wgt 30" 116 lbs. 116 lbs. 134 lbs. 84 lbs. 84 lbs. CB3-26 6 3" H x 26"L 30.5"
CB6-26 13 6" H x 26"L 33.5"
CB9-26 18 9" H x 26"L 36.5"
CB3-30 7 3" H x 30"L 30.5"
CB6-30 15 6" H x 30"L 33.5"
CB9-30 21 9" H x 30"L 36.5"